Exporter of a wide range of products which include 142 mm pitch drag chain and forged link conveyor chain. Flights Available in M.S/C-45/Hardox and other special materials on Request. Tripcon Takes due care in Welding and Post Welding Procedures. 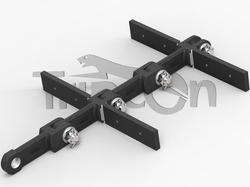 Tripcon Drag Chains are built for rugged applications.This chains are also available with scrapper and digging flights. Forged Links chains comes in varieties of Flight Attachments which are welded to Links. Pitch is 142 mm and it comes in light and heavy duty models. Pitches such as 125 mm , 150 mm , 200 mm , 250 mm are also available in special manufacturing batches. Looking for Forged Link Chains ?